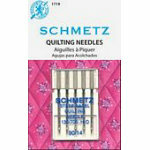 This needle has a special taper to the slightly rounded point which easlily penetrates the thick layers of your quilt while preventing damage to the materials. System: 130705 HQ. Size 1490. 5 needles per pack. Carded.